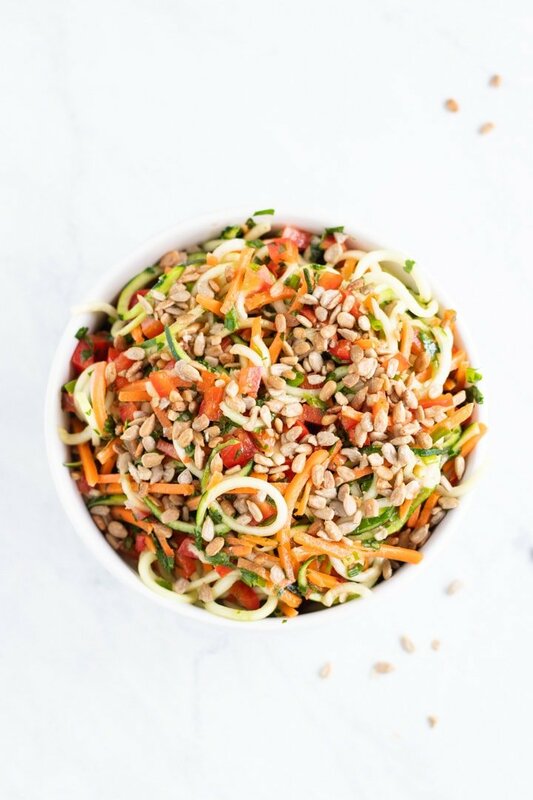 Fresh and colorful, this 10-minute Low FODMAP Asian Zoodle Salad is DE-lish! Make this fast and flavorful salad recipe for a simple no-cook side dish salad. Sometimes I just crave a light and refreshing salad that’s full of crunch. 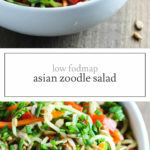 This Low FODMAP Asian Zoodle Salad offers all that and more! 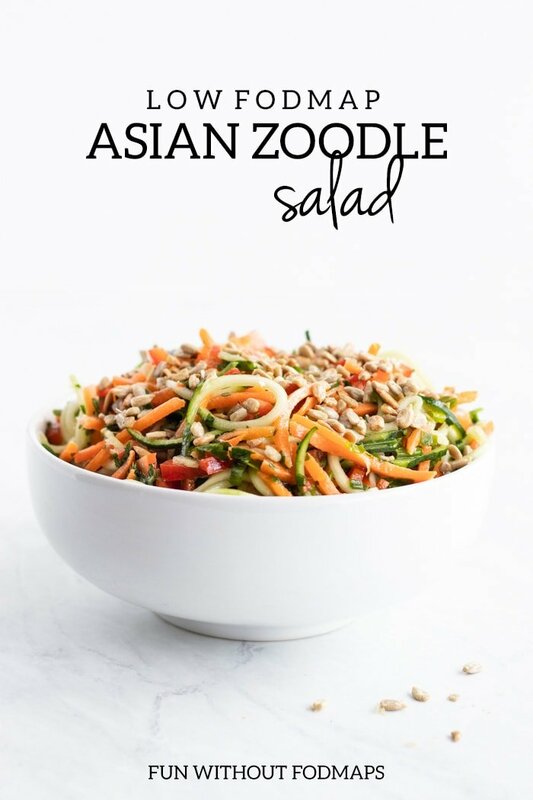 It’s filled with a FODMAP-friendly serving of zoodles, crunchy carrots, colorful red peppers, yummy herbs, and a quick Asian-inspired vinaigrette. It’s light, refreshing, crunchy, and flavorful. 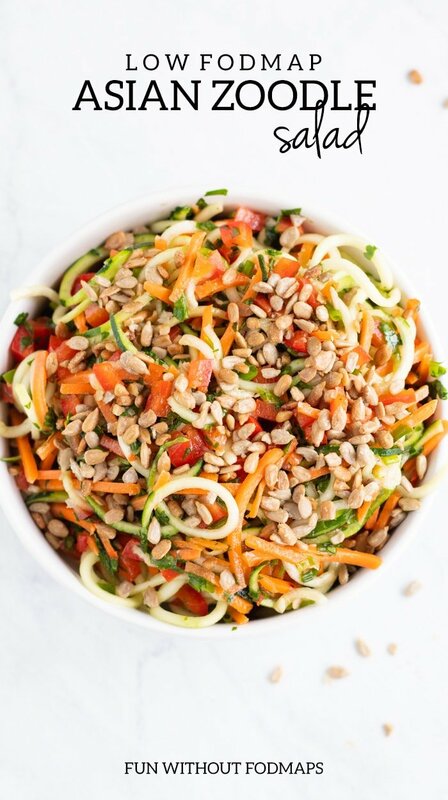 When I make this salad, I like to make use of pre-made zucchini noodles and shredded carrots that I can pick up ready-made at my local grocery store. It does cost a little bit more to buy these pre-prepared veggies, but for me, sometimes the convenience is worth more than the added cost. And these pre-prepared products make this salad come together in a breeze. I like to serve this salad with a serving of lean protein and maybe a FODMAP-friendly whole grain to make more of a balanced meal. Some of my go-to options for lean protein include shrimp, chicken, tempeh, and tofu. For whole grains, I like to serve this with a little quinoa or brown rice. 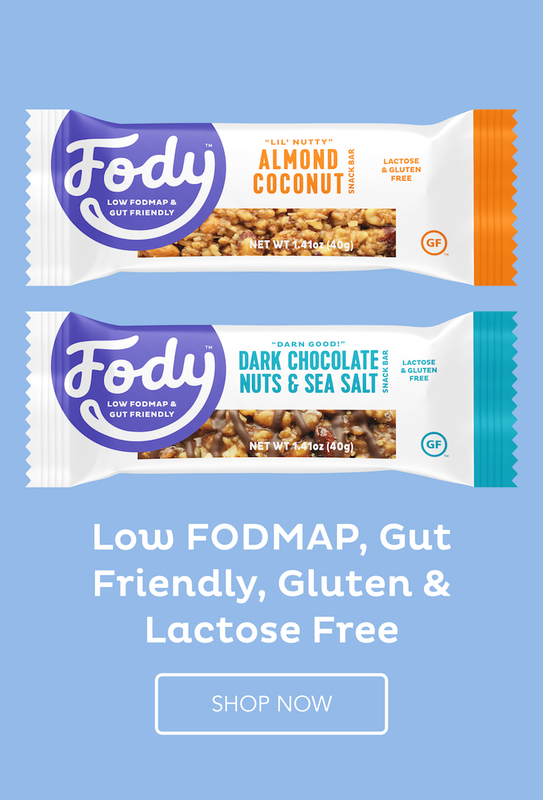 Please check the Monash University FODMAP app for the latest low FODMAP serves for tofu, tempeh, quinoa, and rice. 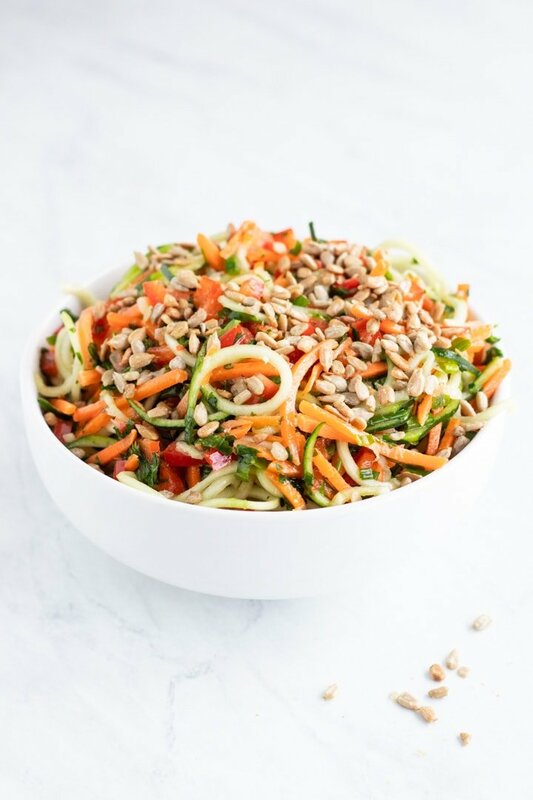 Just an FYI, the serving size of this salad is a bit limited due to the smaller serving of zucchini that’s considered “safe” for those who are in the low FODMAP elimination phase. With said, if you know you tolerate larger servings of fructans, feel free to enjoy this salad in larger servings. 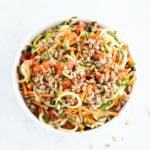 Fresh and colorful, this 10-minute Low FODMAP Asian Zoodle Salad is DE-lish! Make this fast and flavorful salad recipe for a light lunch or serve with shrimp for a quick supper. 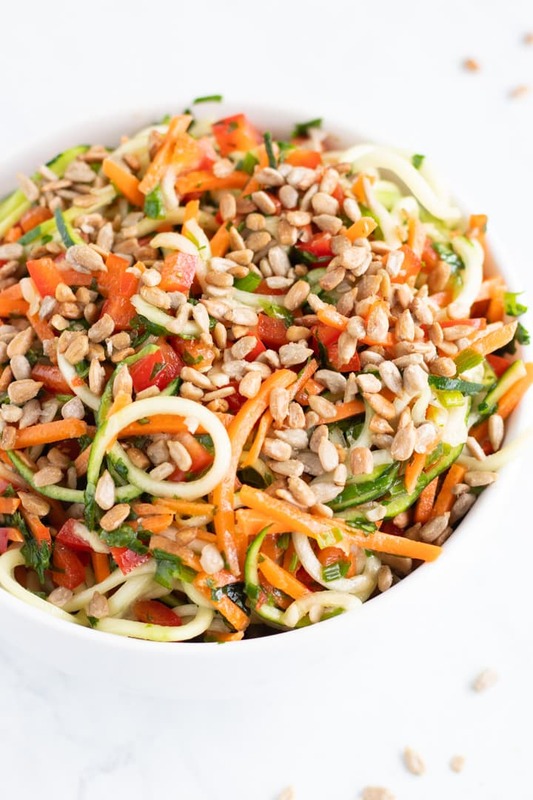 Toss together zucchini, carrot, pepper, cilantro, and chives in a large bowl. Set aside. In a small bowl, whisk together rice vinegar, sugar, olive oil, and sesame oil. Season to taste with salt and pepper. Add dressing to salad mixture and toss to coat. Garnish with optional sunflower seeds and red pepper flakes. This salad is best when served immediately after preparing. Sunflower Seeds: A low FODMAP serving is 2 teaspoons, hulled or 6 grams, according to Monash University. The FODMAP Friendly Food Program has also tested sunflower seeds to be low FODMAP in servings up to 3 tablespoons or 30 grams. Note: This recipe was originally posted on March 23, 2017. 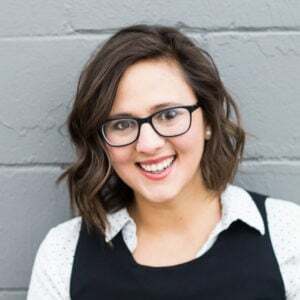 It was modified and updated to reflect current low FODMAP recommendations on January 28, 2019.